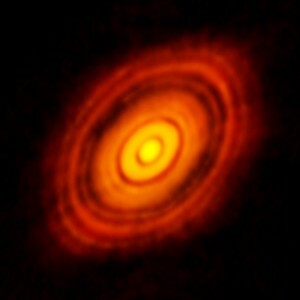 Figure 1: An ALMA radio image of the protoplanetary disk around the young star HL Tau. The circular disk appears elliptical because it is inclined with respect to our line of sight. With ALMA’s high resolution capabilities, the image shows dark gaps in the disk, which are formed by protoplanets sweeping out the dust around their orbits. Today’s paper attempts to explain why the planets are forming at those particular positions in the disk. Figure from ALMA and NRAO. One of the primary goals in the creation of the ALMA radio array was to find evidence of actively-forming planets in protoplanetary disks. Last Fall, as part of ALMA’s testing and verification procedures, the telescope observed the protoplanetary disk around HL Tau, a young Sun-like star about 140 parsecs (450 light-years) away. The exquisite resolution allows us to see bright rings in the disk, separated by dark gaps (see Fig. 1). These gaps form when small protoplanets become large enough to start sweeping up the dust and gas around them, leaving dark tracks along their orbits where the dust levels are low. In order to form a protoplanet, tiny dust grains (carbon or silicate-based molecules a few microns across) in the disk must first collide and stick. They form larger and larger bodies as they collide through random interactions. Finally, one is large and massive enough to start sweeping up material around it through gravitational attraction. How fast this process occurs depends on how easily the particles stick together, which in turn depends on what they’re made of. Bare “rocky” grains have a hard time sticking together after a collision. But lab experiments show that “icy” grains (those on which water or other ice has condensed) are much stickier and less likely to fragment later. Therefore, protoplanet formation is thought to be more efficient in regions where ices are able to condense onto grains. Now that astronomers have evidence for forming protoplanets in HL Tau, this model can be put to a direct test. 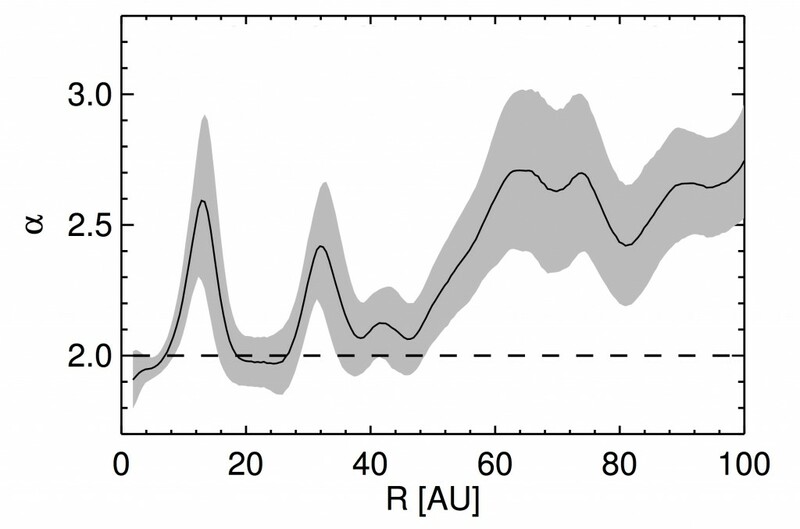 The authors of today’s paper show that the locations of the protoplanetary gaps in HL Tau are to be expected from the condensation points of common ices in the disk. The authors consider a long list of possible ice species, including water, carbon-monoxide and -dioxide, methane, and ammonia. They assume abundances of each ice based on Solar System comets, which are though to reflect the original composition of the Sun’s protoplanetary disk. Each type of ice has a condensation temperature at which it should freeze-out from gas phase onto grain surfaces, given a reasonable estimate of the pressure in the disk. The temperature in the disk decreases with radius from the star, so for each ice there is a radius where the disk becomes cold enough to condense the ice. This radius, for that species of ice, is known as the species’ snow line. In addition to making grain-sticking easier, the snow line should create a pressure bump, helping to trap materials at that position and make it even easier to form planets. Figure 2: The black curve shows the intensity (in “brightness temperature” units) of the disk, as a function of radius. Dips at 13, 32, and 63 AU show the location of the gaps. The red curve is a model of the temperature in the disk, and colored bands show where the listed ices should form snow lines based on that model. The predicted snow lines agree well with the positions of the gaps, suggesting that ice condensation has been responsible for accelerating the planet-formation process at those locations. Figure 2 from Zhang et al. 2015. After taking into account a model for the temperature in the HL Tau disk, the authors can derive the expected location of the snow line for each ice they consider. The authors then analyze the ALMA images and derive distances from the center of the disk to each of the three major gaps. They find radii of 13, 32, and 63 AU, using the established distance to HL Tau of 140 parsecs. These locations agree very well (see Fig. 2) with the expected snow lines for water, ammonia, and carbon-dioxide, respectively, which are thought to be the three most abundant ices in the disk. 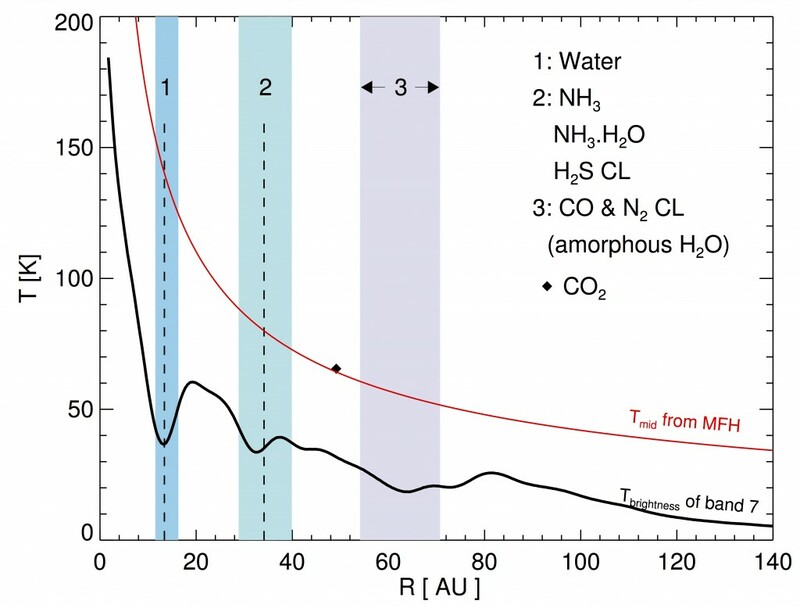 The HL Tau observations, therefore, are a strong confirmation of this model of ice-aided planet formation. Using images of the disk in several different frequency bands, the authors also hope to constrain information about the dust from which the protoplanets are forming. If, indeed, the snow lines have helped dust grains grow to larger sizes in the gaps, then the properties of the thermal emission (which comes from the warm dust) should differ in the gaps than in the rest of the disk. By taking the ratio of the flux in one band to another, the authors derive a spectral index (α) at each position in the disk. The spectral index measures how much the intensity increases at higher frequencies (smaller wavelengths). The index can be used to estimate the maximum size of dust grains in the emitting region. In the main disk, α=2 throughout, while α increases to 2.5 in the gaps. A spectral index of α=2 should mean that the dust grains in the disk are very large, above centimeter sizes. However finding α>2 in the gaps implies that the dust grains are smaller in the gaps than in the rest of the disk. This flies directly in the face of the idea that the gaps show the location of increased dust growth! What’s wrong with the model? In order to explain this conundrum, the authors come up with the idea of two populations of dust particles. One is made of small, rocky grains, which alone would result in a spectral index of α>2. The second population is made of much larger, icy grains, which emit at α=2. In the disk, second-population grains of centimeter sizes would dominate the emission, resulting in α=2. But in the gaps, the second population grains could have grown even larger (to decimeter scales). They would be large, but few and far-between, so most of the emission in the gaps would come again from the α>2 first population. This extrapolated model will need much more observational confirmation in order to become accepted. The authors may suffer from over-eagerness to fit the observations, rather than admitting the (exciting) possibility of a conflict. Perhaps the dust particles in the gaps really are smaller, because the larger particles have already been swept up by the protoplanets? We could be learning new and unexpected things about planet formation from this possible conflict. Regardless, the authors have clearly shown that the first observed planet-forming gaps in a disk match well the expected locations, assuming the onset of snow lines provokes increased planet formation. As ALMA continues to observe protoplanetary disks, we should soon find more examples of ongoing planet formation, which will help confirm or discard this new two-population model of dust grains. This excellent new facility, in full-science mode for only a few months now, has already begun to push the boundaries of our understanding of how planets form. Look forward to more exciting results in the years to come! Missing Spirals and Forming Planets Where to Look for Baby Planets Sneak a peek on the cause of death of protoplanetary disks How can planets be heavier than the disks that formed them?